Various persons connected Garvey’s prophecies of the crowning of a black king who would deliver black people from their oppressors, with certain biblical passages that confirmed to them that Selassie was indeed the Messiah. Interestingly, these persons are said to have reached this conclusion quite independently of each other. Among the key figures in this birth of the Rastafarian philosophy were Leonard P. Howell, Joseph Nathaniel Hibbert, H. Archibald Dunkley and Robert Hinds. All were ministers, who formed separate groups based on this revelation. Howell is the man most credited with the initial spreading of the Rastafarian way of life. He was a well-travelled man and was reported to have fought on African soil and to have command of several African languages. Howell had stationed himself for a period of time in North America where the social ravages of racism were common practice. This directed his intent in working for necessary reforms. He began his ministry in the slums of Western Kingston, Jamaica. Joseph Nathaniel Hibbert was a member of the Ancient Mystic Order of Ethiopia, a secret society, who after spending many years in Panama returned to Jamaica and began preaching of Emperor Haile Selassi as the returned Messiah. Hinds was his deputy. Hebbert started his mission in St. Andrew, and came to Kingston to find Howell preaching the same doctrine. H. Archibald Dunkley, a Jamaican seaman, studied the Bible independently for over two years and concluded that Haile Selassie was indeed the Messiah that Marcus Garvey had prophesied. He started his mission in Port Antonio, Jamaica but soon moved to Kingston. There were several other Ministers and preachers that preached the words and truth of Rastafarian as they perceived it, such as Paul Erlington, Vernal Davis and Ferdinand Ricketts. By 1934, a solid nucleus of Rastafarian had been established in Kingston. Howell and Dunkley, in trumpeting the cause of Rastafarian, both paid penance. They were jailed and became targets of repeated harassment, with Dunkley also being committed to an asylum. These encroachments on their personal freedom only ignited the ideologies and practical solutions that Garvey had offered and along with Mortimer Planno, one of Bobs first Rasta mentors, gave Bob Marley the yearning to embrace the Rastafarian way of life while still in his teens. Mortimer Planno not only influenced Bob Marley but also was the liaison between the establishment and many of the Rastafarian community. Planno a well-educated articulate Rasta gained even more credibility when he greeted Haile Selassie upon his arrival to Jamaica in 1966. Rastafarian is a challenge to Eurocentric values and a highly motivated thrust that seeks within its members its own cultural identity. The eye of the storm of Rastafarian is focused on the inherent right of a people who have long been “depressed”, to reposition them within the realms of the laws set by JAH. Within Rastafarian teachings there are a few differences in terms of practice and structure, but all uphold his Majesty Emperor Haile Selassie as the return of the true Messiah. It should be pointed out that while the fountain flows with many streams of water it does not change the substance of the matter that spurts forward. Or you have many roads that lead to the promise land but only positive souls are allowed to ride on it to JAH’s house. Rastafarian is not dreadlocks and a spliff (joint). It is a way of life that is not dependent on feigned social freedoms. Rastafarian prefers to opt instead for something less material and more meaningful-truths and rights. In other words…being in the world but not of it. Herb, Marijuana, Collie or Ganja is considered a Sacrament to Rastafarians and is used to act as a channel to a calm and conscious temporal spirit much as Christians and Jews use red wine. Rasta’s believe that this use of Ganja was granted to them by the words of Jesus in the fields of Zion, ” God gives man all green herbs, trees and plants bearing fruit with seeds” This he did while standing in a field of Cannabis. Genesis Book 1 verse 11,12,29; Rasta’s also believe that smoking Ganjas will allow them to use positive common consciousness. To arrive at a clear and realistic view of Rastafarian, one has to see it for what it is – a way of life: not a myth, cult, sect or figment of any one individual’s imagination. Rastafarian is the adherence to basic life principles and the expression of them through positive means. Socialization within the prescribed norms of the general populace has not been the aim of the Rastafarian. Thus, what has developed from Rastafari’s concerted effort to change is a more definitive and heightened cultural awareness through language, mode of dress, natural eating habits and seeking of a clear channel away from confines of captivity. The Rastafarian way of life has taken up where the dread middle passage voyages sought to disconnect. The uncut, uncombed growth of hair, or “dreadlocks” as it is commonly referred to be the crowning antenna that keeps Rastafarian in tune. Sharp perceptions, and warnings of predatory dangers are the benefits. Locks are not plaited, waxed or mixed with cow dung as many misinformed rumors have spread. Nor are they the habitations of the creeping creature known as the “forty Leg” or centipede. There are many that through circumstances or choice do not wear the covenant, but are nonetheless principled. Of course there are also many in disguises that are masquerading charlatans and utilize that appearance to do other than good deeds. Dreadlocks are traceable to early civilizations of Africa, such as the Masai warriors along with other indigenous tribes. The Rastafarian way of speaking or “reasoning” is not illiteracy, as some would have you believe, but the tailoring of the European language for more identifiable self-expression and modification of it to highlight the positive. Changes in vocabulary and syntax are also a conscious act of protest against the established mores of “Babylon”. Babylon is an evil force, be it a place, person or persons, way of life or anything dealing with negativity and hate. Babylon is antiprogressive, its sole mission is to confuse and persuade the positive loving righteous to change their way of believing. One refers to one self as “I and I” to express divinity of the God that is ever present and within the individual. 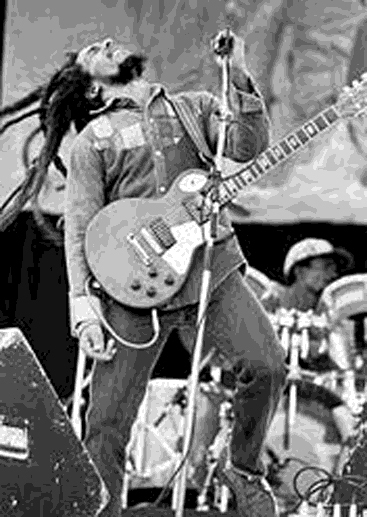 “I” is an assertion of individuality and of the importance of JAH. “I” is substituted for all pronouns, such as “me”, “you”, “we”, “them”, which, are considered, too be detached. Because “I” is so important, the first syllables of certain words are replaced by the sound; so that “vital becomes “Ital.”, “ever” becomes “Iver”, “Ethiopia” becomes “Ithiopia”, “creation” becomes “Ireation”. Rastafarian dress codes usually emphasize a prominence of the identity colors and styles. The Colors Red, Gold & Green play a significant part in the Rastafarian doctrine. Red is for the blood shed by the people, Gold is for wealth granted to his people and Green is for the Fertility of the Earth. While Rastafarian continues to generate debate, its numbers are ever increasing. What more is left for foes of Rastafarian to do but stand aside and marvel at the sight of those who have endured innumerable indignities as they step progressively towards Zion. It seems to be in the interest of “men” manipulators (those of cowardly persuasion) to keep the righteous ignorant of who they are and to brainwash them to deny all existence of their originality. But Rastafarian “bredren and sistren remain fastened to that which claims and no disowns them.